Cartoon character Adrien Agreste looms large in front of design plans for Niverville High School, as he apparently did in naming efforts for the new school as well. An access to information request by The Carillon revealed that Adrien Agreste High School was the top submission from the public. Hanover trustees chose the name Niverville High School instead. Say what you will about the choice of the new name for the Niverville high school, but never suggest the discussion over a name wasn’t animated. 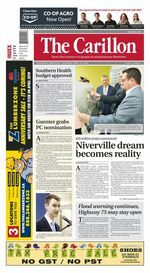 On Oct. 2, Hanover trustees announced the high school’s new name would be just that: Niverville High School. The board’s decision came following a naming committee recommendation and a public call seeking name submissions for the new school. The choice, trustees said in a release at the time, was made after receiving feedback from students, parents and guardians, staff and community members. What other ideas were received? The division wouldn’t say. On Oct. 4, HSD board chair Ron Falk "respectfully declined" The Carillon’s request for a list of all submissions that were considered. That prompted the newspaper to submit an access to information request to the division, which was replied to on Monday along with a list of monikers that just weren’t to be. So, now we know, that of the 180 public submissions, 79 of them advocated for the high school to be named in honour of one special, fictional, catsuit wearing, teenage boy: Adrien Agreste. Agreste, a character from the animated television series Miraculous: Tales of Ladybug & Cat Noir, appears to have no obvious ties to the Niverville area, much to the chagrin of the likes of William Hespeler and Joseph-Claude Boucher de Niverville, whose vote tallies came in far below that of the cartoon superhero, otherwise known as Cat Noir. The next closest name submission was simply, Niverville. It received 46 submissions. With the exception of William Hespeler, who received 11 votes, all other entries were in the single digits. Sadly, Maple Syrup High School, Barack Obama High School and the Garganulon Academy of Witchcraft and Magick never stood a chance with only a handful of votes between them. The new high school is expected to open in September 2019.